Researchers from Finland and Japan have formed the smallest Swiss cross using bromide atoms on a sodium chloride surface. The academic journal Nature Communications has published the team's results. The team used bromine atoms, 20 of them, and positioned these on a sodium chloride surface to form the cross. 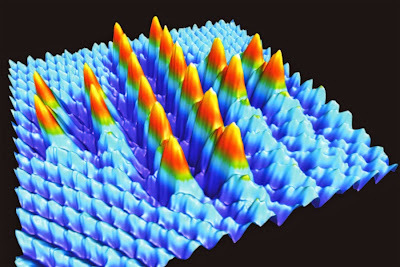 Using an atomic force microscope, the structure was found to be stable at room temperature. The bromine atoms were exchanged with the chlorine atoms to make the structure; by moving and positioning the single atoms. It is the first time that systematic atomic manipulation on an insulating surface have been achieved at room temperature. The resulting Swiss cross measures 5.6 nanometers square. This discovery can lead to the development of next generation electromechanical systems, advanced atomic-scale data storage devices and logic circuits. The manipulation of atoms has reached a new level: Together with teams from Finland and Japan, physicists from the University of Basel were able to place 20 single atoms on a fully insulated surface at room temperature to form the smallest "Swiss cross", thus taking a big step towards next generation atomic-scale storage devices. The academic journal Nature Communications has published their results. Ever since the 1990s, physicists have been able to directly control surface structures by moving and positioning single atoms to certain atomic sites. A number of atomic manipulations have previously been demonstrated both on conducting or semi-conducting surfaces mainly under very low temperatures. However, the fabrication of artificial structures on an insulator at room temperature is still a long-standing challenge and previous attempts were uncontrollable and did not deliver the desired results. In this study, an international team of researchers around Shigeki Kawai and Ernst Meyer from the Department of Physics at the University of Basel presents the first successful systematic atomic manipulation on an insulating surface at room temperatures. Using the tip of an atomic force microscope, they placed single bromine atoms on a sodium chloride surface to construct the shape of the Swiss cross. The tiny cross is made of 20 bromine atoms and was created by exchanging chlorine with bromine atoms. It measures only 5.6 nanometers square and represents the largest number of atomic manipulations ever achieved at room temperature. Together with theoretical calculations the scientists were able to identify the novel manipulation mechanisms to fabricate unique structures at the atomic scale. The study thus shows how systematic atomic manipulation at room temperature is now possible and represents an important step towards the fabrication of a new generation of electromechanical systems, advanced atomic-scale data storage devices and logic circuits.